From a distance it looks like a giant ship which has been beached atop a cliff by the mighty forces of some super tsunami. 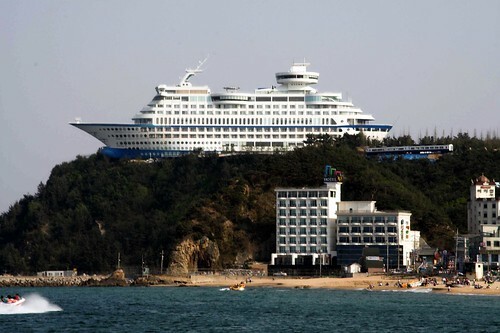 In reality it is a purpose built luxury hotel in the shape of cruise ship. 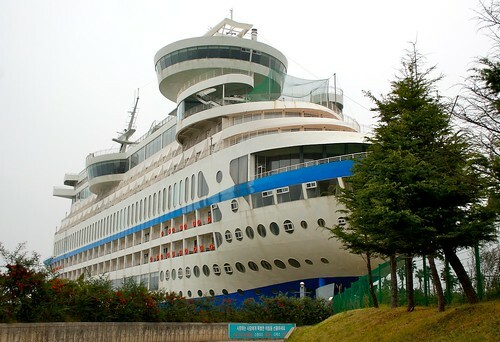 The Sun Cruise Resort Hotel in Jeongdongjin, South Korea, is a true copy of a cruise ship, 165 metres (541 ft) long and 45 metres (148 ft) tall. It was designed and constructed by a shipyard and is reportedly the the first of its kind in the world. The hotel has all the facilities and fixtures found on a cruise ship including its cabins which have windows similar to those founds on a real ship. In order to provide a true experience of a ship, sound of sea waves is played on its deck and in its rooms. Its sports facilities include a netted golf range, volleyball court, and a fitness club. Its swimming pool even has salt water in it. Its overhanging bow and observation post provide a panoramic view of the area which is famous for beautiful sunsets. In words of many it is ideal place to get experience of a sea cruise without getting sea sick. The complex also has a park located next to the hotel and the nearby Yacht club has been designed to look like a ship with sails. Credits: I am thankful to Ed Man (member of Google Earth Community) who brought this to my knowledge through a post in GEC.